1. Roy Harold Scherer und Doris von Kappelhof were better known as ..... ? 2. Which songs begin with the following words ? 3. Plus or minus 20,000, how many people in the world are 100 years old or more ? 4. What do Bruce Willis, Jackson Browne and John McEnroe all have in common ? 6. The Peace of Westphalia ended which bloody long war ? 7. 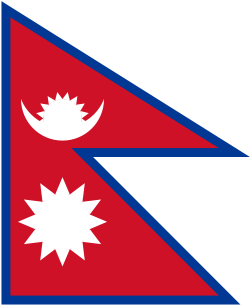 What is the only country in the world with a flag that does'nt have four right angles ? 8. Seven men have won the Wimbledon singles title who fit the following criteria. Their first and last initial are the same. For example, Robert 'Bobby' Riggs. R R Name the other six. 10. Name the three countries in the world that begin with the letter T which have a star and a crescent moon on their flag. 5. England and Portugal The Anglo-Portuguese Treaty of 1373 was signed between King Edward III of England and King Ferdinand and Queen Eleanor of Portugal. It established a treaty of "perpetual friendships, unions [and] alliances" between the two seafaring nations. It was reinforced throughout history, including in 1386, 1643, 1654, 1660, 1661, 1703, 1815 and by a secret declaration in 1899. It was recognized in the Treaties of Arbitration in the 20th century between Britain and Portugal in 1904 and 1914. It was activated again during the Second World War, whereupon the Portuguese remained neutral, in agreement with Britain, which did not want to bring the war into the Iberian Peninsula, until 1943, when it was fully reactivated by the National Government of Winston Churchill and Portugal. Britain, after 3 months' negotiations, was accorded aerodrome and nautical facilities in the Portuguese Azores to help combat the U-boat threat. Despite the fact that the treaty has technically been in effect for nearly 650 years does not mean that it has always been practically carried out. Widespread war has rarely been waged between the two, but that does not mean it has never been. In the Dutch-Portuguese War, the British, seeking to curtail Hapsburg power, aided the Dutch in their war on Portugal, which was by then a dependent vassal of Hapsburg Spain. There was also a forcible disarming of the Portuguese military in the territories Portuguese West Africa, Portuguese East Africa, and several islands in the Atlantic by the Western Allies, due to Allied fears of Portugal joining the Axis and fighting alongside Germany. 6. The 30 years War The term Peace of Westphalia refers to the two peace treaties of Osnabr?ck and M?nster, signed on May 15 and October 24 of 1648 respectively, which ended both the Thirty Years' War in Germany and the Eighty Years' War between Spain and the Netherlands. The treaties involved the Holy Roman Emperor, Ferdinand III (Habsburg), the Kingdoms of Spain, France and Sweden, the Dutch Republic and their respective allies among the princes of the Holy Roman Empire. The Peace of Westphalia resulted from the first modern diplomatic congress and initiated a new order in central Europe based on the concept of national sovereignty. Until 1806, the regulations became part of the constitutional laws of the Holy Roman Empire. The Treaty of the Pyrenees, signed in 1659, ended the war between France and Spain and is often considered part of the overall accord. 9. Warlock Warlocks are, among historic Christian traditions, said to be the male equivalent of witches (usually in the pejorative sense of Europe's Middle Ages), and were said to ride pitchforks instead of broomsticks which normally witches would ride. In traditional Scottish witchcraft, "warlock" was and is simply the term used for a wizard, or male witch.